Tired of light and color exhibits that are too dim to see even in a darkened gallery? That use hot, expensive projector bulbs? And don’t really engage your audience? Then check out our latest versions of these favorite classic exhibits, along with some new ones too, using the latest super bright LEDs. 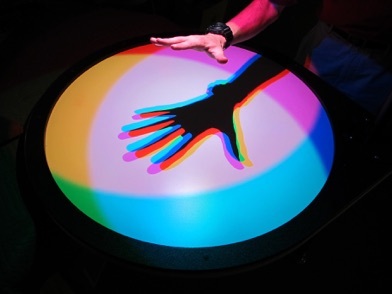 We developed these exhibits in partnership with the Montshire Museum of Science in Vermont. Prototypes of all components were sent to Montshire where the staff did extensive formative evaluation with their audience. Guided by their feedback we developed five exhibits in all. 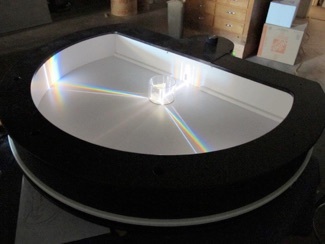 ‘Light Rays’ is similar to the classic ‘Light Island’ exhibit found in many science centers. But with way more impact! It starts with three intensely bright, almost laser sharp parallel rays of light. 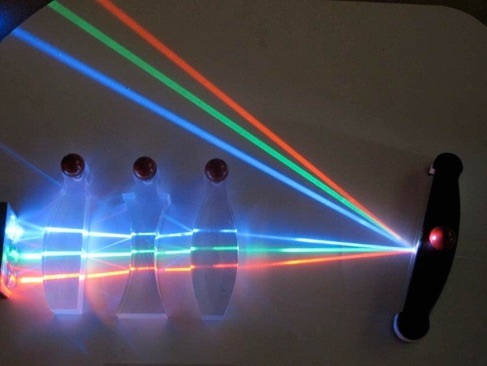 Lenses, prisms and mirrors in various shapes can be placed in the path of these rays, to experiment with the ways that optical components can bend and aim light by refraction and reflection. ‘Colored Shadows’ has usually been presented as a room sized installation with 150 watt spotlights aimed at a white wall. 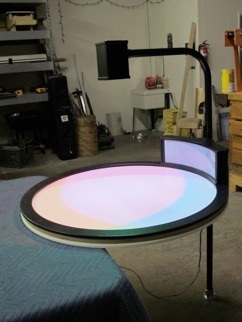 But for Montshire we made an intimate, table top version using LEDs that require just 5 watts. These LEDs produce gorgeous eye catching colors, and because the light sources are so tiny, the edges of the shadows are razor sharp. ‘Spectrum’ is another classic exhibit that we significantly improved by using LEDs. In fact, in many of the versions you see in science centers and classroom demos, the spectrum is barely visible (except for a few that use the sun as the light source, which is a whole other story). In this version, the rainbow is bright and broad. 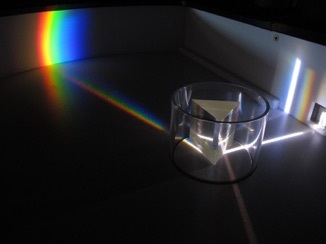 We used the best prism we could find, with ultra high refractive index and high dispersion. It’s mounted on a precision turntable that can be rotated 360. The light source is a custom line array we designed using 7 tiny LED point sources and a precision cylindrical lens to focus the white light in a tight, intense beam precisely on the prism’s axis. In a reasonably dim room the results are stunning. 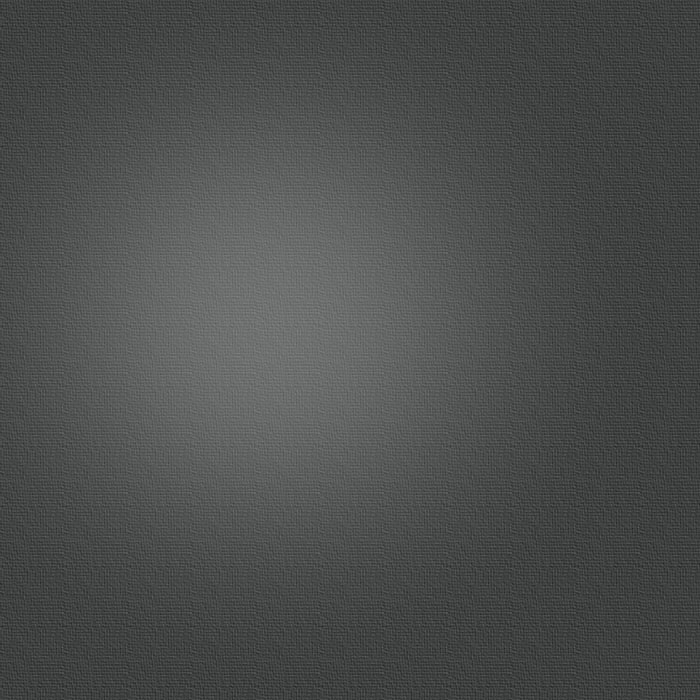 ‘Rotating Filters’ provides another way to show how white light is a mixture of many colors. A white LED projects a circular beam, into which various filter wheels can be inserted. Many people expect that combining a green filter with a red will produce yellow light, and are surprised to see otherwise! ‘Comic Chameleon ’ on the other hand, shows how the apparent color of an object depends on the color of the light that hits it. 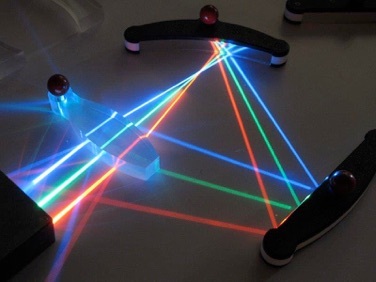 It uses red, green, blue and ultraviolet LEDs. 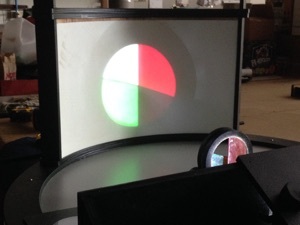 By turning the control wheel, these colors of light are mixed in varying proportions. The video gives some idea of the effect — Gumby turns yellow, and orange turns black, invisible ink appears, etc. — but it’s hard to capture with a camera. 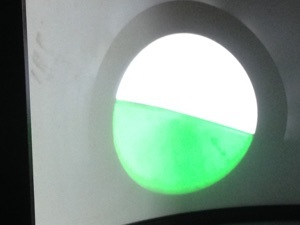 There is also a white LED, controlled by a separate pushbutton, which shows the ‘true’ color of the objects.